As simple as putting skis on is, a lot of beginners really struggle to put on their skis. As with most things though, there are some basic rules that need to be followed, and then everything will be much easier. The skis need to be lying across the slope (at a right angle to the fall line). This is so they won't start sliding away as you put them on, and so that once you have the skis on you will be standing sideways and shouldn't slide anywhere. You must be careful to make sure the skis are sideways to the local gradient of the slope, as it only takes a small miscalculation for the skis to start sliding. Make sure there is no snow stuck to the bottom of your ski boot, if there is too much snow stuck to the boot, the binding will not close properly. To remove the snow the easiest way is to stamp on the front part of the binding, with the areas under your toes and heels, until the snow has come off. Be aware that this can involve stamping really quite hard. This might make the ski come out of position as well, if it does you need to put it back in the correct position. Also once you have cleared the snow, if you put your foot down on the snow again, more snow can get stuck to the boot, so it is generally best to do this one foot at a time just before you put each ski on. Always put on the downhill ski first. 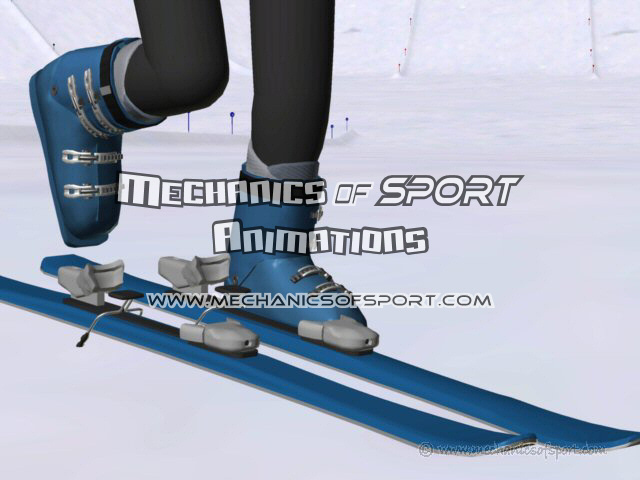 To put the ski on, the bottom of the boot needs to be at the same angle as the base of the ski, otherwise the front of the boot will not slide into the binding properly. It can be very difficult to get the boot at the right angle if the uphill ski is put on first. If you have poles with you, use them to keep your balance while you are lining your boot up, and removing the snow from the bottom. It is not so easy standing on one leg, on a slippery surface, while wearing strange boots, when you are not used to it. Obviously the order in which you will need to do these things will need to be mixed, matched and repeated, but if you make sure you follow them you should have no problem when it comes to putting your skis on. To actually put the boot into the binding, you need to make sure the boot is leant over at the same angle as the ski is, and slide the lip on the front of the boot into the toe cup on the front of the binding. Then line the heel of the boot up with the back of the binding, and bring the heel of the boot down into the heel cup. Once the heel is inside the heel cup, push down on your heel until the heel cup clamps down and the binding lever clicks up. This part is all very simple, the bit that most people have problems with is getting themselves in a position where they can actually put their skis on. Below is an animation of how a boot goes into a binding, showing all the stages clearly. 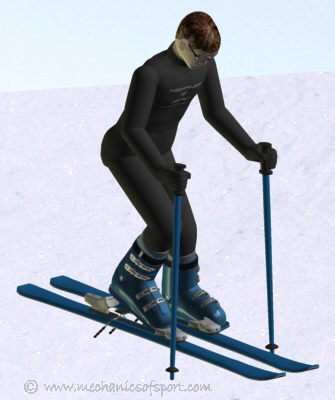 The animation is of a ski being put on, on a flat area at the top of a slope, after the skis have been lined up, and the snow cleared. If you are trying to put your ski back on after a crash where the ski has come off. Before you try to put the ski back on, it is very important to make sure the lever on the back of the binding is down. If the lever is up, you need to push it back down, or the ski will not go on. On to the Taking Skis Off section.